At Berkshire Hathaway HomeServices Hawai`i Realty, we are committed to delivering exceptional service, building rich and trusted relationships, and improving all that we touch. By partnering with a well-established, universally respected brand that represents strength, integrity and respect, we are able to provide clients with knowledgeable, trusted, high touch service that covers all facets of their real estate needs. Providing an environment that enables our agents, staff and the company to grow together and truly serve our community, Berkshire Hathaway HomeServices Hawaii Realty has built an `Ohana of professionals who believe in mutual respect, stability, learning and innovative thinking. Service is our business. Making a positive difference is our goal. Get all the training you need from the ground up. "If you look at our mission statement, they’ve really nailed what real estate is all about; it’s about relationships. Berkshire Hathaway HomeServices is higher touch in their relationships inside the company and with the people they interact with outside the company. You’re surrounded by it every day." "The Berkshire Team behind the scenes has helped my reach my goal, to become a trusted authority and specialist in Hawai’i Real Estate. There’s a great leader heading a team with a huge variety of experience. And they’re always willing to help with the questions I have. What more could I ask for?" 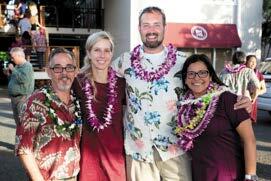 "Working with Berkshire Hathaway HomeServices Hawaii Realty is like working with a circle of your best friends. The ohana that management has created here makes it a treat to come into the office. The support from the admin staff as well as my fellow agents is invaluable. I’m also truly impressed with the IT, the global reach of our website, and our Luxury Collection branding. I can’t think of any brokerage on the island that offers the same kind of dedication to their agents."